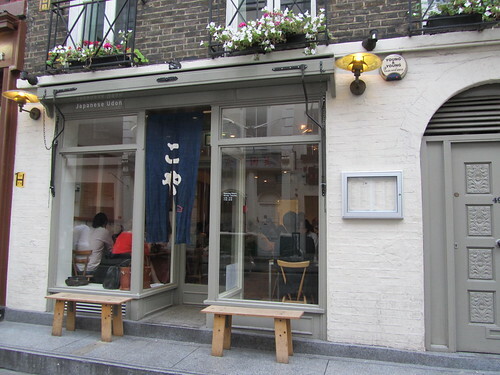 One of the marks of a good Japanese restaurant in the UK is whether or not Japanese people eat there. I went to London’s Koya the other night, under recommendation from Japanese friends. Stepping into the small, slightly cramped restaurant felt like stepping into Japan. The smell, the atmosphere, the decor – it was all the real thing. Koya is predominantly an udon (noodle) restaurant, although they do have other dishes on the menu (such as rice bowls and side dishes). The udon noodles come in different varieties: atsu-atsu (hot udon in hot broth), hiya-atsu (cold udon with hot broth) and hiya-hiya (cold udon with cold sauce). 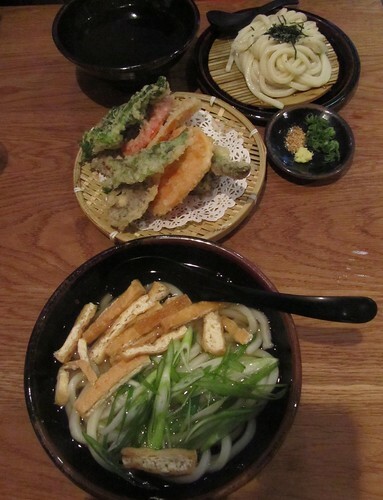 Below, you can see the “kizami” (hot udon in hot broth, with fried tofu and spring onions) which I ordered, and the “yasai ten hiya-atsu” (cold udon with hot broth, and vegetable tempura) which my friend ordered. The food was delicious, filling, and not badly priced. Although we had to wait to enter the restaurant (due to its popularity), the service was great and the staff were very friendly. They don’t take reservations, so if you go to Koya you should expect to have to wait before you can get in. It’s probably not the best place to go with a big group of people, or for an intimate date, but for a casual lunch or dinner with a friend or two it’s the perfect place. Koya （こや) is open from Monday – Saturday, 12:00 – 15:00 and 17:30 – 22:30. It’s on Frith Street in Soho (W1D 4SG), right in the heart of London. Check out their website for more information: http://www.koya.co.uk.